During every re-read of William Gibson's Neuromancer, I yearn for a world choked by technological corporatocracy and virtual vaults ripe for a single coding god's plundering. 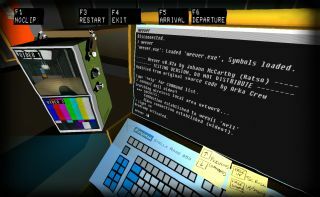 Blendo's Quadrilateral Cowboy excited us at PAX with just that kind of hacker heist masterminding, and today, GameTrailers has published a new video demonstrating various commands deployed through the game's mobile hacking platform. Have a look above. Also, I still need to figure out a more graceful shorthand for this game beyond "Quad Cow."